Chances are, whether you’re a fan of boxing or not, you’ve come across the name Floyd Mayweather. It’s a name that’s quite hard to miss, as the boxing legend has become a rising icon in the sports over the past couple of years. His boxing style, braggadocio, and winning streaks have painted a man who’s not afraid to get into the ring against any opponent. His unbeaten record proves that he is worthy of the recognition he has garnered, and we take a look at how he rose to become the legend that he is. Born Floyd Joy Sinclair on the 24th of February, 1977 in Grand Rapids, Michigan, Mayweather did not have it easy growing up. He was born in a home of boxers; his father Floyd Mayweather Sr. who was a contender for the welterweight champion against Sugar Ray Leonard. His uncles, Jeff and Roger Mayweather were also professional boxers. He was named Sinclair after his mother Deborah Sinclair who used to be addicted to drugs. He went to Ottawa Hills High School, but because of his mother’s drug use decided to drop out and take care of her instead. When not taking him to the gym, his father would sell drugs by night time so he could put food on the table. 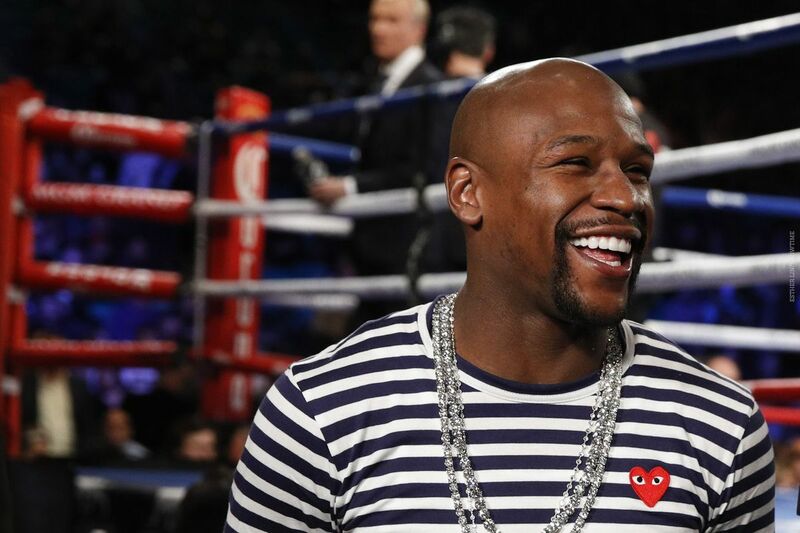 Floyd Mayweather has also said that he was beaten severally by his father. His father at one time served a prison sentence, at which point Mayweather was sent to live with his grandmother. Boxing had always been a part of his life right from the start, and at a very young age, he had already decided that he was going to chase it as a profession. Even his grandmother acknowledged his potential by encouraging him to follow the dream, rather than look for a job to do. He changed his name from Sinclair to Mayweather, an indication that he was ready to put on the gloves and step into the ring for real. Mayweather began his career as an amateur boxer, winning Golden Gloves championships in ’93, ’94 and ’95. He finished amateur boxing with 84 wins and 8 losses. In 1996, he won bronze in the Atlanta Olympics by reaching the featherweight division semifinals. His first professional match was on the 11th of October, 1996 against fellow newcomer Roberto Apodaca. At this point, his uncle Roger was his trainer and his father was still in prison over illegal drug trafficking charges. From ’96 to ’98, a lot of Mayweather’s fights were won by either a knockout or TKO. He received a lot of praise from pundits in the boxing world, with some commentators predicting that he would become one of the greatest boxers ever. Floyd Mayweather’s first championship, the WBC super featherweight, was won when he beat Genaro Hernandez with a TKO. It was the first defeat for Hernandez in the weight class, and after the fight, the boxer gave his respect and praise to Mayweather. He had the chance to defend his title and retained it after a TKO win against Angel Manfredy. It was another record win, as it gave Manfredy his first defeat in four years. Floyd Mayweather would go on to defend his title five times, winning against his opponent each time. His unbeaten record stayed intact, with none of the fights going beyond the eighth round in length. Mayweather would take this run into the lightweight, light welterweight, welterweight and light middleweight classes, remaining unbeaten every single step of the way. Overall, Floyd Mayweather’s boxing career was from 1996 to 2007, with a brief off period and then from 2009 to 2015 when he retired. He made a one-fight comeback in 2017, and after that officially hung his gloves as a boxer. All in all, Mayweather had an unbeaten record of 50 wins, the total amount of matches he had in his professional career. Daughter, Son, Wife or Girlfriend? 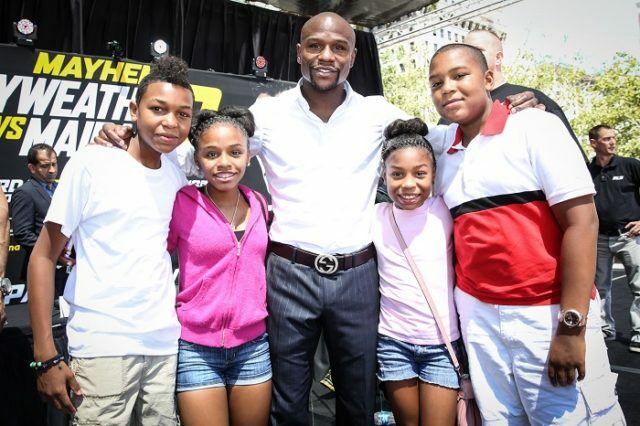 Floyd Mayweather has never been married, but currently has four children; two boys and two girls. Josie Harris, his ex-girlfriend is the mother of Koraun and Zion—his two sons, and Jirah, one of his daughters. He and Josie were high school sweethearts before they split in 2007. During the time, they had a rocky on-and-off relationship. He dated Melissa Brim during one of the off times in his previous relationships, and the couple split in 2012. Together they have a daughter called Іуаnnа. Mayweather is said to have dated other women; Shantel Jackson, Jessica Burciaga, Doralie Medina as well as Liza Hernandez. However, none of them ended up walking down the aisle with him. It came to light in 2018 that he was dating a lady called Abi Clarke, and has gone as far as introduced her to his family. It is yet to be seen if they will get married or not. Floyd Mayweather stands at an easy 5 ft. 8 in / 173 cm with a weight of 151 lbs. / 68 kg. He has a chest span of 40 inches, waist size of 31 inches and his biceps are 14.5 inches. His shoe size is a US size 8, a European size 41 and a UK size 7.5.